Michael On Fire (Michael Colone) makes it clear that this is not a double CD but two separate discs in one package. Call it what you will, the music herein is wholly captivating and intelligent song writing from a master craftsman. Twenty albums into a career that has taken him from Detroit to Los Angeles to Nashville, he has been produced in the past by Stephen Stills, has recorded at Muscle Shoals Studios, and he has performed and recorded as a solo artist and as a band leader. Of the two albums gathered here, The Solstice Session is a look at Michael on Fire right now and Tracks Along the Way is an overview of the past 25 years. Both are riveting looks at a modern troubadour. He sometimes seems to be John Lennon-inspired, but is clearly his own man. No One To Kill, from The Solstice Session, is a particularly powerful song on which he sings “We rang all the bells all over the Earth/We did what we could whatever that’s worth/We burned all the uniforms fire for heat/Ain’t no other sides. Ain’t no one to beat.” Call Off The Dogs (“Better think fast. Better beware/Keep Your Eyes Open. Better take care/Strong concentration. Deep Meditation/True Concentration. You get a bad reputation”) and Evening In the Everglades (“Spanish Pirates. Spanish Moss/Hope we find the treasure/Found some comfort from the storm, also found some pleasure”) are standouts from this first set. On the Tracks Along the Way disc are a couple of songs that have gained the status of classics from his legion of fans: I’ll Make You a Drum (“Will you make me a drum. Will you make me a drum/So I can make thunder and bring back the sun”) and Chief Redbird’s Violin (“I learned to play the fiddle on Chief Redbird’s violin/Only wish I could play like him/Never even met the man but I could feel his soul/Every time I held his violin). Healing Waters (“The healing waters of the Great Spirit/heal the pain”) and the anthemic Whatever Happened to America (“Whatever happened to the big front porch” and to the corner store, and drive in and the PTA and radio and farmers, etc. )are also standouts in a collection rife with brilliant songs. Much of the lyrical content of his material is related to the earth, often from the perspective of the Native Americans. All of it is stimulating. 'Healing Waters' is up 46 spots on the Americana Charts to #132. Healing Waters - the new record! from an interview with the Artist Advocacy Foundation. Q: So what’s new in the world of Michael On Fire? MOF: Today is new. I have lived long enough to realize that every breath is new for me. The more I complain or the more cynical I get, the more the world and my life takes on those qualities and that kind of temperament. To breathe my breath and be grateful for the things I've seen, the places I've been, the experiences I have had, makes me realize how truly unique and blessed I am, then that becomes the reality for me. I attended the International Folk Alliance this year and realized very few of the people there have my longevity and the miles and profound experiences of being a full-time musician. I got to hang out with some people my age and older, and it was cool because we know that to have even made it to the here and now we have had to be outlaws and mavericks, because we’ve somehow managed to exist outside the very narrow parameters of the music industry. So, the exciting thing is to get up and exist another day and somehow gift the world, my generation and my children with the courage it takes to follow one's own heart and path. I seek those who are peaceful, joyous, honest, courageous, creative, healthy and tolerant of the day-to-day brutality of greed and commercialism. Every day is a new challenge to maintain our humanity and our dreams. So today what is new for me is to play that magic chord in a way that I have never played it before and somehow be of some worthy service to myself, my children and my family, my friends and those that truly need something other than the obvious nonsense that we are all faced with on a daily basis. In the past month, “Make Me a Drum” off the Michael On Fire Live in London CD has gotten a whole bunch of radio play, with new “adds” showing up in Maine, New Hampshire, Connecticut, New York, New Jersey, Pennsylvania, Maryland, Virginia, North Carolina, Florida, Georgia, Alabama, Tennessee, Kentucky, Ohio, Michigan, Indiana, Illinois, Wisconsin, Minnesota, North Dakota, Iowa, Missouri, Mississippi, Oklahoma, Texas, New Mexico, Colorado, Idaho, Montana, Washington, Nevada, California, and Hawaii. International play has been reported this month from Peru, Colombia, Trinidad and Tobago, Latvia, Ukraine, Romania, Bulgaria, Macedonia, Qatar, Saudi Arabia, Korea, and the Philippines. You can watch the Live performance of the song, from London, here:http://www.youtube.com/watch?v=QhZQkWCS9Bg. "Cadillac Ranch" arrived at radio this week, and broadcasters in Colorado were among the first to pick up on it, with the title cut being added at KVNF (Paonia) and KDNK (Glenwood Springs), and "Burma Shave Memory" being played at KAFM (Grand Junction). TOGETHER IN 1965, MICHAEL AND I EMBARKED ON A VOYAGE, A QUEST, CRUSADE IN SEARCH OF LOVE AND REASON. WITHOUT LOVE THERE IS NO HOPE AND WITHOUT HOPE WE HAVE NO REASON. WITHOUT REASON THERE IS NO FUTURE. WE WERE JUST 15 YEAR YOUNG WRITING SONGS, RECITING POETRY LECTURING ON CYBERNETICS AND THE VALUE OF NONVIOLENT PROTEST. PLUM STREET, THE ARK, WAYNE STATE, OAKLAND UNIVERSITY AND MORE. WE WERE ON A MISSION LIKE OTHERS AT THE TIME. THE WHITE PANTHER PARTY, JOHN SINCLAIR, MC 5, STUDENTS FOR A DEMOCRATIC SOCIETY SO MANY WHO OPENED THEIR MOUTH TO YELL AND SELL THE REVOLUTION OF THE LOVE GENERATION ONLY TO ASSUME IN TIME THE PASSING OF POLITICAL POWER TO THEIR HANDS AND THEN RULE WITH FEAR LIKE THOSE FOOLS BEFORE THEM SITTING ON THE SIDELINES WHILE IN THE RAW EACH NEW GENERATION PAYED A PRICE FOR THEIR WHIMS AND OBSESSIONS. THE COST INCURED MADE LEGAL BY LAW WAS A LOSS OF FREEDOM, LIBERTY AND/OR LIFE. IN THE RAW...THE RAW...SPELL IT BACKWARD....."WAR." FOR EACH COUNTRY TO ACHIEVE ITS NATIONAL AGENDA DO YOU BELIEVE IT IS YOUR PATRIOTIC DUTY TO FOLLOW, WITHOUT QUESTION, REFUTE AND AT ALL COSTS AS ORDERED. ALL ROADS LEAD TO OTHERS AND EACH OF US HAVE THE RIGHT TO FOLLOW A PATH OF CHOICE. BUT NO MATTER WHICH DIRECTION YOU CHOOSE REMEMBER ALL ROADS CAN LEAD TO YOUR DREAMS BUT IF YOU DON'T GO YOU WON'T GET THERE. FOR WHAT IT'S WORTH MY ADVISE, AS YOU TRAVEL YOUR ROAD OF CHOICE WHEN YOU PASS OTHERS GOING IN A DIFFERENT DIRECTION NEVER SAY YOUR GOING THE WRONG WAY. JUST SAY I'LL SEE YOU AT THE TOP.. I TIP MY HAT TO MICHAEL FOR BEING ONE OF THOSE FEW WHO TRAVELED ONE ROAD, DROVE STRAIGHT AHEAD WITHOUT MAKING A REST STOP. Get never-before-heard recordings TWICE A MONTH, plus LYRICS OF THE WEEK, STORIES, VIDEOS, PHOTOS, A COMMUNITY FORUM, and more. The challenge for independent musical artists is how to get their music out to an expanding circle of people who might want, need or otherwise appreciate it. It is with this in mind that we introduce the Michael on Fire music Music & More Subscription service – to further connect artist and audience, thus providing an outlet for Michael to create and produce new music, and an opportunity for people who want to hear it and share it with others. For just $1.67 per month ($20 year), subscribers will receive two recordings per month, including many brand new songs recorded for the very first time, along with some gems from the archives, and also live recordings from various Michael on Fire concert performances. These songs will come to you as mp3 files, which you can easily download to your computer, phone or iPod. Sign Up Now and receive your very first song, written and recorded within the past few weeks. - a forum - to share your thoughts, impressions and insights with others in the community. Sign Up Today, and start receiving Michael on Fire music delivered direct to you. As part of this introductory offer, when you sign up, you are also eligible to purchase a subscription for someone else, as a gift, for just $16.70; that’s Two Months Free! If you buy 10 subscriptions (remember it’s that time of the year for exchanging gifts) the price is $15 per year – that’s a 25% savings off the regular subscription price. So join us in launching this new and exciting program, celebrating creativity, independence, and … community. We want to send out a shout and a "thank you" to our friends at Range Radio (and rangeradio.com) for spreading the music all over the country and across the continent via an extensive syndicated network of terrestrial and internet broadcasters. This week, they added "Chief Redbird's Violin," "Marlboro Country" and "Apache Wind" to programming, and on their partner network, Caribou Ranch Radio (of Caribou Ranch fame - the legendary recording studio in the Rocky Mountains) they added those three songs plus "Violet Skies," and "All the Wild Horses" from the Commanche Moon CD. Check 'em out, they're playing some good music. , as well at stations in Australia, England and Italy, and Sweden! Michael’s new “album,” Always Yes, is done and at the manufacturers. It includes 13 songs, covering a broad spectrum of Michael’s natural roots oriented music styles, including country, blues, big ballads, swamp-rhythms and more. Michael is joined on the record by musical compadres Ced Curtis, David Reinstein, Jamie Ascenzo and Tyson Leonard. The record is due out in early January, but we’re so excited about it that we can’t wait that long to share it with you, so over the next couple of weeks we’re going to be providing you with “sneak peeks” of several of the songs. Today, we begin our “sneak peek” series with the first two songs on the CD, called “Righteous Man” and “Chief Redbird’s Violin.” Enjoy. In other news, Michael’s Enchanting Holiday Music is (for the 13th straight year!) in rotation throughout the holiday season on The Weather Channel television broadcasts. You can purchase Enchanted Holiday Music at http://www.cdbaby.com/cd/colonemichael, and if you’re so moved you can call or write the Weather Channel to say “thanks” for playing it. Another of Michael's instrumental pieces - "Old Buck Theme" - has been added to the list of his compositions that have been featured on on The Weather Channel. For more than a decade several selections from his Enchanting Holiday Music CD have been programmed heavily throughout the holiday season on The Weather Channel bringing international exposure and a world wide following to his music. Paul Thorn at the Santa Monica Pier. Paul McCartney was pretty darn cool. CD includes 10 songs, seven of which have never appeared on record before. Viva l’Amor, I Don’t Mind Growing Old, Cold Night in Abilene, Lord Have Mercy, Cadillac Beach, Do You Have Any Heart, Jubilation, I Remember the Angels Cried, Indigo Blue, West of Eden. 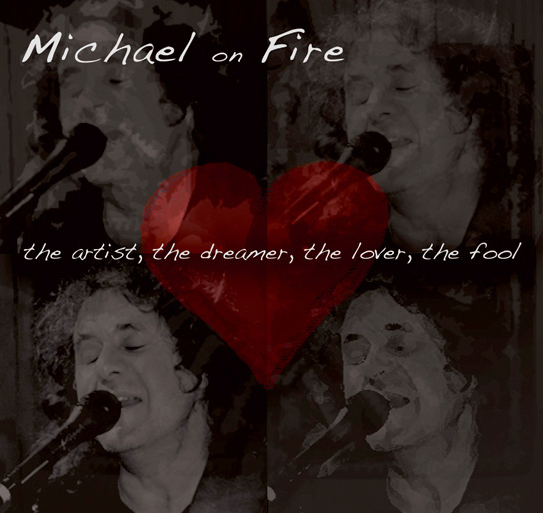 features five songs by Michael on Fire.